If you put four fawn-coated black-faced mastiff breeds: a Boerboel (undocked), a Canary Dog (with uncropped ears), a Dogue de Bordeaux (with a black nose, as permitted in its standard) and a Bullmastiff, in a show ring with an all-rounder as a judge, I am prepared to bet that they would confuse the breeds. The most apparent breed identifier should be the head in each case, but with specialist Bullmastiff judges so often ignoring the breed standard's words on the breed's head, it is hardly surprising if confusion reigns. So many Bullmastiffs now resemble fawn (or brindle) American Bulldogs, because untypical heads are being rewarded. If this continues, breed type could soon be threatened and big Bulldogs replace the true breed of Bullmastiff. The head construction is often a decider when identifying breeds; the Braque St Germain looks like our Pointer at first glance, but when you look at the stop and the occiput, then the ear carriage, it is easier to separate them. This is true too of the two recognised ridgeback breeds, a Thai Ridgeback has a different ear carriage from the Rhodesian version, with most of the latter being stronger in build. Closer to home, the Mastiff is expected to be bigger than the Bullmastiff, but at World Dog Shows it is easy to confuse the two. 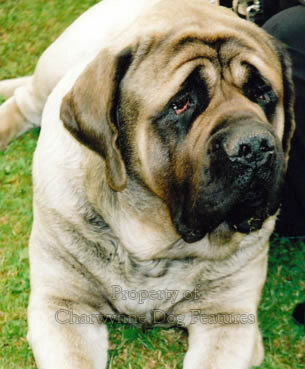 For me, the contemporary Mastiff has lost its classic head and is too heavy-headed and loose-lipped. But sadly the Bullmastiff is now changing, with the help of show ring judges, from being 60% Mastiff 40% Bulldog to being 75% Bulldog 25% Mastiff, not what the pioneer breeders sought at all. 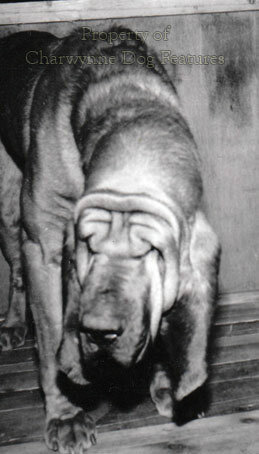 A round-headed stub-nosed dog with a wrinkled forehead contradicts the Bullmastiff standard, but dogs bearing such features are richly rewarded in today's show rings. There should not be such basic differences within a breed, not if breed-identity and breed-type are truly valued. But has the pursuit of breed-identity prevailed over soundness in some breeds? The parties to the European Convention for the Protection of Pet Animals evidently think so. Their resolution on the breeding of pet animals, adopted by multilateral consultation ten years ago names guilty breeds. They aim to: set maximum and minimum values for height and weight in very large and very small breeds, set maximum values for the proportion between length and height of short-legged dogs (Basset Hounds and Dachshunds) to avoid disorders of the vertebral column, and set limits to exaggerations. The latter include: shortness of the skull, so that breathing difficulties are avoided (citing the Bulldog, Japanese Chin, King Charles Spaniel, Pug and Pekingese), abnormal positions of legs (straight stifles in Chows, Buhunds, Lapphunds), (bowed legs in Basset Hounds, Shih Tzu, Pekingese), very long ears (Cocker Spaniel, Bloodhound, Basset Hound), and markedly folded skin (Bulldog, Basset Hound, Shar Pei, Pug and Pekingese). It also seeks to set limits to abnormal size and form of eyes or eyelids (St Bernard, Basset Hound, Bloodhound) and small deep-lying eyes (citing four terrier breeds, Chows, Newfoundlands, etc. ), as well as large protruding eyes (Boston Terrier, Cavalier KC Spaniel, Dandie Dinmont, Brussels Griffon, etc.). We supply the largest number of breeds in this list of any country and the breeds listed are illustrative, not inclusive. Any breed featuring too short a muzzle could be included in future listings. But it's all in the name of the breed, I hear. What that usually means is: it's all in the name of show ring success; if they don't look like that, they don't win. This is no comfort to the dog or unfortunate pet owners coping with a discomforted dog. The head of the Bullmastiff is one of its main breed points, but it should not, according to its KC-approved breed standard, be Pug-nosed. The breed standard specifies quite precisely that the distance from the nose-tip to the stop must be approximately one-third of the length from the tip of the nose to the centre of the occiput. A shorter muzzle is a breach of the breed standard and an exaggeration. 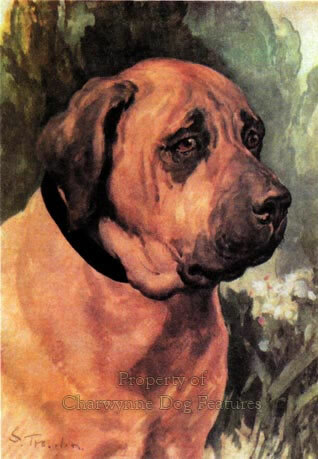 Yet Bullmastiffs quite often become champions, rewarded by both breed and all-round top judges, with muzzles which breach the standard, as well as featuring a degree of wrinkle, in repose, which also breaches it. A well-known Bullmastiff breeder and judge recently told me that she has both correct and incorrect (i.e. too short) muzzles in her kennel. The dogs with approved muzzle length can run and run; the ones with incorrect muzzles are out of breath all too quickly and suffer in the heat. It is shaming that the European Convention is needed; it is good to know that our KC is starting to act to reduce such distress; too short a muzzle does bestow distress. I recently attended a game fair on a warm but not hot day; several hundred dogs were present: a Foxhound pack, a Beagle pack, a collection of hunting Bassets for a competition on the flags, gundogs for a scurry, working terriers for a show, racing Whippets and over a hundred visitors' pets. Of all of these dogs only one, an American Bulldog with a short nose, became distressed by the warmth of the day. A decade ago I attended the World Dog Show in Brussels; a Bulldog collapsed in the ring in the heat and had to receive emergency attention. Within half an hour, it was back in the ring, only to end up in the veterinary room, being given oxygen and covered in ice-cubes. The wretched Bulldog just could not breathe properly through its muzzle-less mouth. This is direct cruelty and should be prosecuted. Our KC has recently amended the Bulldog standard to include: 'Dogs showing respiratory distress highly indesirable'. But does every judge know of this? 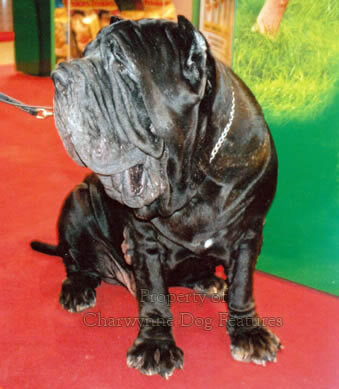 At the Neapolitan Mastiff Club's Open Show of the 9th of April 2005, the judge was an extremely knowledgeable very competent Dutch breed specialist. In his critique on the open dog class he wrote: '...over the years I have come across quite a few bad eyes, but some entries managed to make me almost speechless; how is this possible...searching for eyes, which proved to be too small, too deep set and severely damaged.' Did the exhibitor-owners of such dogs themselves have 'severely damaged' eyes which prevented their spotting such a handicap? I think not; but the standard for this breed does actually stipulate eyes that are 'set fairly deep'. That is most unwise and the breed standard, which is owned by the Kennel Club, needs early amendment. No other mastiff breed has such a requirement; this is not a breed difference but a breed disability, and an intolerable one. Aha, I can hear exhibitors exclaim, if I don't follow the breed standard, how can my dogs win? Any humane fancier would ignore breed points which inflict disabilities, whilst lobbying for such a harmful requirement to be removed without delay. A dog show is a competition between good dogs to decide the relative merits of the entry. That competition should never preclude the best interests of the dogs as well as the breed. Does competition bring out the worst in people? When exhibiting livestock, I found only friendly competitiveness. But sadly I have witnessed a much more aggressive approach in the dog world, reminding me of the account in the Aberdeen Press and Journal, some years ago, which read: "One main event in London was Cruft's Dog Show. For two days dogs and dog owners from all over the country crowded the huge halls and galleries, barking at one another in fierce competition." But by itself a breed standard is just a start. The standard of the Bloodhound states very clearly 'eyes neither sunken nor prominent' but I see show ring Bloodhounds with sunken eyes. Those in the Bloodhound packs, bred for function, do not feature such a liability. 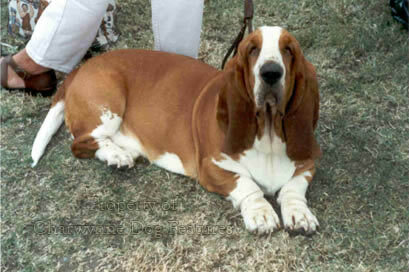 But the same could be said of Basset Hounds too. In Germany there is now a modern term for breeding which imposes cruelty on dogs: 'qualzucht', literally, torture-breeding. Nearly twenty years ago, the Dutch Ministry of Agriculture produced a booklet entitled 'Mooi, Mooier, Mooist' (Beautiful, more beautiful, most beautiful) denouncing progressive exaggeration in dog breeds. It created little debate at the time. A few years ago, at the world congress of kennel clubs in Ireland, Uwe Fischer, president of the VDH, the German Kennel Club, exhorted judges not to give awards to dogs with exaggerated, aberrant characteristics, listing length of coat, eye size, shortness of muzzles and extremes in size in both giant and dwarf breeds. I believe that our own Kennel Club will instruct UK judges similarly in due course. It would make sense to anticipate this and act accordingly. Breed differences need not be exaggerations, as the terrier breeds demonstrate. Some breed differences are potentially harmful, because genetically they can be progressively exaggerated. But if exaggerated dogs could never win prizes, then real progress could be made. It is only a matter of time before an edict is issued from Britain's equivalent of Uwe Fischer, firmly instructing show ring judges to stop rewarding exhibits bearing exaggerated features which cause the dog distress. Bullmastiffs with jaws shorter than their breed standard stipulate should never become champions. But there is a financial reality to be faced by those breeders (in several breeds) who breed or exhibit dogs with truncated muzzles. First of all the KC will in the future insist on amendments to the standard (which they own) to outlaw such a feature; no dog can then win in the show ring with too short a muzzle. And secondly, and perhaps coincidentally the UK will ratify the European Convention on exaggerations in pet animals, and short-muzzled dogs will have no future. This would leave some breeders with nowhere to go as exhibitors and nowhere to sell their stock. Apart from a return to honesty in finally respecting the breed standard, there will be an about-turn needed by those Bullmastiff judges who have elected, either through ignorance or disrespect for the breed standard, to reward untypical exhibits. The writing is on the wall. "Another fault we find in some animals is muzzles. Here we often see weakness where strength should prevail. Some people say many of our present-day specimens show too much of the Mastiff muzzle; a few people give other reasons...one cannot afford to ignore these cranks, who in most cases know absolutely nothing about the many subjects they discuss, but do their best to try and get others to imagine they are experts. In Bull-Mastiff circles we find a number of these self-claimed authorities at practically every dog show, but fortunately few people listen to their claims." from Dog World August 1932 written by Arthur Craven, author of 'The Bullmastiff As I Know It'.